The Caribbean Development Bank is a regional financial institution, which was established by an Agreement signed on October 18, 1969, in Kingston, Jamaica, and entered into force on January 26, 1970. The Bank came into existence for the purpose of contributing to the harmonious economic growth and development of member countries in the Caribbean, and promoting economic cooperation and integration among them, having special and urgent regard to the needs of the less developed members of the Region. Read more in the Agreement Establishing CDB. The Rt. Hon. 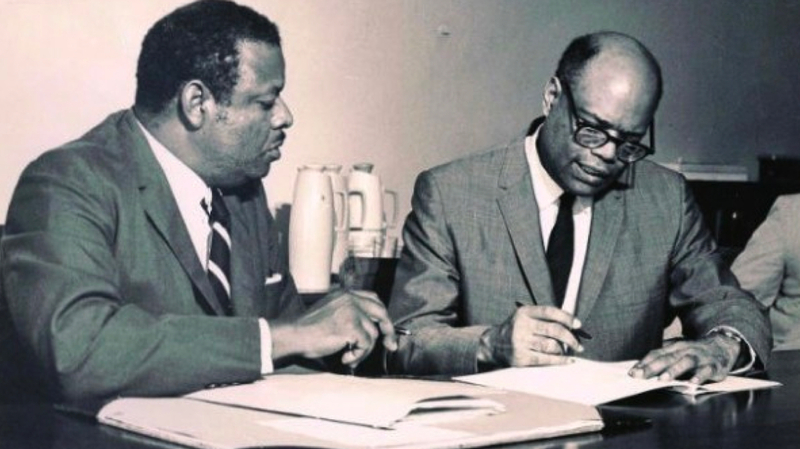 Errol Barrow (left), first Prime Minister of Barbados and Sir Arthur Lewis (right), the first President of CDB sign a document to inaugurate the Bank. After a Canada/Commonwealth Caribbean Conference in 1966, a recommendation was made that a study be conducted to investigate the possibility of establishing a financial institution to serve the Commonwealth Caribbean countries and territories. The report, submitted by a team of experts in July 1967, recommended the establishment of a Caribbean Development Bank with an initial capital of $50 million. This report was considered and accepted at a meeting of officials in Georgetown, Guyana in August of the same year and a committee formed to prepare the draft agreement and finalise the details for the Bank’ establishment. This draft Agreement was submitted in 1968 and adopted after meetings held at the ministerial level. A preparatory committee for the Bank’s establishment was set up and a project director appointed. Assistance was received from the International Bank for Reconstruction and Development (later called the World Bank), the Inter-American Development Bank and the United Nations Development Programme.